Using ServiceTrade's job item costing and gross margins feature, you can track the gross margin percentage on any job as you create its invoice. This lets you manage the profitability of each job, and spot potential trouble areas (shrinkage, incorrectly entered item costs, etc), before your customer receives their invoice. A job item's cost is the amount that you paid for that item, or (for items such as labor) the total amount of cost that your company incurs when using that item. For instance, you might set your labor item's standard cost to be the loaded cost for an hour of your technician's labor, including their salary, commissions, benefits, equipment costs, etc. Only users who have been granted the "View and Edit Job Item Costs" activity can see and edit job item costs. The total cost of the job is the sum of all the job items' costs, multiplied by their quantities. To set the standard cost for an item, go to My Account -> Item List and click on the description of the item that you want to edit. You may have different costs for the same labor item for different technicians. For instance, a senior technician may have a larger compensation package (and therefore a higher hourly cost) than a junior technician when performing the same labor. You can assign costs to a specific technician by editing their profile and assigning costs to each of your labor items. Go to My Account -> Users, find the technician to whom you want to assign costs, and click their name. On their profile page, open the 'Labor Costs' section and enter the costs for as many items as you wish. You are not required to enter costs for each labor item; technicians will receive the standard cost (if there is one) for any items for which they were not assigned a specific cost. IMPORTANT: Technician-specific costs are ONLY assigned to job labor items if the technician is assigned as the source for that job item. Job labor items that don't have a technician source will ALWAYS get the standard item cost instead, regardless of which technician is assigned to that job. See this support article for more information about assigning technicians as job item sources. IMPORTANT: You can only assign technician-specific costs to items that have a type of 'Labor'. 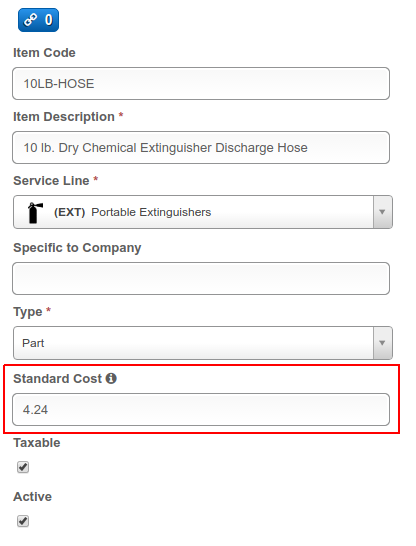 Other item types ('Part', 'Service', etc) cannot have technician specific costs assigned, and do not appear in the 'Labor Costs' section of the technician's profile page. See this support article for more information about creating items and assigning them a type. In other words, the gross margin on a job is the percentage of your job's profit relative to the total revenue of the job. As you make changes to the invoice (add or remove items, change invoice item unit prices, etc), the gross margin for that job will change in real time. IMPORTANT: Job items represent your costs (that is, what you actually used), while invoice items represent your revenue (what you are charging the customer). This gives you the flexibility to be able to charge your customers for different types or quantities of items than what you actually consumed on a job, while keeping both your revenues and costs represented accurately. Q: Is sales tax included in the gross margin calculation? A: No. Gross margin is calculated using the invoice subtotal (pre-tax). You should never take sales tax into account when calculating gross margin, because sales tax is neither revenue nor cost. Q: Can my technicians see my item costs? A: Only if you let them. Only users who have the "View and Edit Job Item Costs" activity can see and edit item costs. If you do not want to let your technicians see item costs, make sure that none of the roles that they are granted include this activity. The default "Account Tech" role in ServiceTrade does not include the "View and Edit Job Item Costs" activity -- so any technicians assigned only this role will not be able to see or edit job item costs. Q: I am working on a job's invoice. How do I change the job's cost (what I see in the TOTAL JOB COST section)? A: To change the total cost for a job, go back to the job page (there's a link back to the job near the top of the invoice page), open the Job Items section, and click "Manage Job Items". 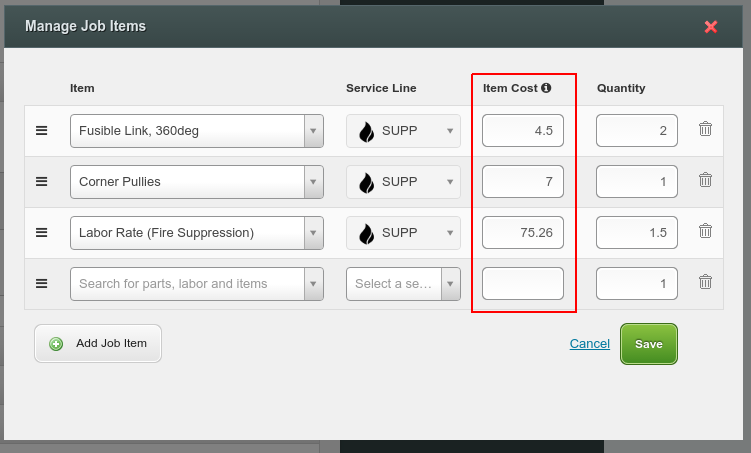 Q: I would like to edit my job items' costs from the invoice page. Why is there a difference between job items and invoice items? A: Because your job items might not necessarily match up to your invoice items (though they usually do). Remember that job items represent your costs, but invoice items represent your revenue. In most situations, there's a direct match between the costs that you incurred when delivering a job, and the revenue that you achieve by charging your customer for delivering that work -- but not always. Consider this scenario: Whenever you use a 5-pack of Shiny Widgets, you charge your customer for the entire 5-pack. However, on a particular job, you may only use 3 of the Shiny Widgets, and the other two may become truck stock, or go back into inventory in your warehouse. So, you have 5 Shiny Widgets' worth of revenue, but only 3 Shiny Widgets' worth of cost. And your total cost would be 3 x $4.50 = $13.50. And your total revenue would be 5 x $8.00 = $40.00. You may have other scenarios where you need to invoice your customer for more/fewer, or altogether different, items than what you actually used on a given job. Do job costs transfer to Quickbooks or Intacct? No. Job items will not necessarily correspond one to one with invoice items, and job items are the place where costs live (in ServiceTrade). Does my customer see gross margins or costs? No. These are private to you, and are not shared on printed or emailed invoices. Why aren't my labor items appearing in the 'Labor Items' section of my technician's profile pages? Only items with a type of 'Labor' will appear there. Items with other types ('Service', 'Part', etc) cannot have technician-specific labor costs assigned. It is probable that the missing items have a name that includes the word 'labor', but the item's type is not actually 'Labor'. To fix this, edit the missing item and change its type to 'Labor'. Why didn't my technician's labor cost get assigned to all the labor job items on a job that he was assigned to? Technician-specific labor costs are applied ONLY to job labor items which have a technician source. To assign your technician's labor cost to his job's labor items, edit each of those items, choose an item source type of 'Technician', and then choose the technician's name in the technician list that appears.